I think the general consensus right now is that they do apply to both players but there has been no official ruling one way or the other. i kinda figured as much, i haven't heard an official either. any idea if both my opponent and i have one active if it is cumulative? just reading it literally i would have to assume yes. I'm almost certain I'll forget about this when I'm running any JL one-offs. A: “While active” effects are static effects that are considered to be in play as long as that character is in the Field Zone (NOTE: the Attack Zone is considered a subset of the Field Zone—so “While active” effects are still active when a character is in the Attack Zone). These effects are not cumulative— i.e. the effects only occur once regardless of how many of that character is active in a player’s Field/Attack Zone (however, NOTE: if both players have the same character active, the effects will occur once for each player). As an example, Dr. Doom, Reed Richards’ Rival, modifies the Attack and Defense of all non-villain characters while he is active. 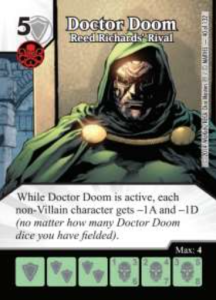 This effect would only occur once regardless of how many Dr. Doom dice a player has active, but would occur twice if two players had a Doctor Doom, Reed Richards’ Rival, active. Last edited by bartok; 06-24-2015 at 05:12 AM. ok, so in the aquaman example when i have one active it only triggers my cards effect, lowering the cost by one. but when my opponent brings one in it triggers his making the cost 2 lower. that makes sense. Important note: The Rulebook quote above is only referring to named characters (like in the DC set, Robin has a bonus for "If Batman is active"). So your opponent's Batman would not trigger your Robin. However, with Aquaman, Wonder Woman, and Dr. Doom, we are not referring to named characters, but affiliations. Abilities that affect characters with an affiliation (be it Justice League, Villains, or characters) affect all characters with that affiliation, for both players (unless the card specifies "your Villains" or "your opponent's Villains"). so, you think Aquaman and WW occur twice if both players have the dices active in each field? Why Wizkids dont answer this? WizKids has said in a few places that text in parentheses is not rules text. It's simply reminder text and shouldn't be taken as an override to the basic rule. So in the Dr.Doom case the basic rule still applies regardless of the reminder text. I field Mystique - Shapeshifter and name my opponent's Aquaman? Seriously though, my interpretation would be that if both of you had an Aquaman fielded, you are already getting -2. Mystique would just be making another copy of your opponent's Aquaman, but it wouldn't increase the bonus. Now if your opponent did *not* have one fielded, then it becomes more interesting. Since Mystique doesn't have to copy an active character, if she turns into your opponent's Aquaman then I could see an arguement that now there are two "different" Aquaman characters active on the field, so both of you would now benefit from a -2. I actually think with the mystique you'd have -3 cost in that scenario. You have -1 coming from 3 distinctly different sources. Since Mystique is directly copying your opponent's card, I would not consider it a "separate source" from your opponent's card. If your opponent had Aquaman, and you didn't but you copied his with Mystique, I'd say it's only -1 not -2. Basically your characters and your opponent's characters are different characters, even if they are using the same card. But Mystique creates another die of your opponent's character. Mystique creates another die of your opponent's character. Copying means that your die takes on the stats and/or abilities of another die. If the text says, “copy the stats,” then the die copies the numerals of the other die, including any benefits that die may have by virtue of a burst symbol. Your copying die also gets to retain its own burst symbol for extra game effects. If the text says, “copy the abilities,” the die uses the opposing die’s card as if it were its own. When a die copies another die, text that references the die’s name applies to the copying die as well. Now, this doesn't detail what "copies that card" means, precisely, but it seems to me that it is closer to "copy the abilities" rather than "copy the stats". So, I think Mystique "uses the opposing die’s card as if it were its own", and that seems to imply something other than creating "another die of your opponent's character", as you suggest. When Mystique is engaged, she copies the die stats and card abilities of one character that she is engaged with. * She also gains an extra +1A and +1D. If my opponent attacks with Dr: Doom and I multiblock with 2 Mystiques, does each Mystique copy Doom? Meaning, would the overall effect for non-Villains be -3A/-3D. Obviously if I block with 1 Mystique, the effect would be -2A/-2D, because that would be the same as each playing having a Doom out and each player's Doom counts. But would the effect stack beyond that with multiple Misty's? This is a 'While active..." effect, meaning it only happens once no matter how many copies a single player has of that die. If your Mystique copies your opponent's Doom, it would be like each Mystique has Doom's card ability - meaning it only happens once even though there are two of them. Your Mystiques would give all non-Villains -1A and -1D, so would your opponent's Doom, for a total of -2A and -2D. If I have both Loki and Joker on my team they both work, independently of each other, even though they have the same ability. Mystique does not become Aquaman, she just gains Aquaman's abilities. How can we be so sure? Her text isn't "copy that card's text" it's "copies that card." That could certainly be parsed as "imagine this card to be an Aquaman card until Mystique leaves play or another Mystique is fielded." I had posted a forums question to clarify this card months ago and naturally it has not been answered.